The open floor plan or “open concept” is one of the most satisfying architectural innovations of the 20th century. The concept of a living space with no defined boundaries or enclosed rooms took off in the U.S. in the 40’s and 50’s as post-war Americans were attracted to multi-purpose homes that provided a spacious looking interior on a smaller footprint. The advent of affordable centralized heating and cooling also permitted for larger open designs where once only one or two rooms would have been controlled. Architecture and history, however, conspired to create an interior design dilemma. In the quest to join the interior with the exterior through nature and light, we are frustrated in unifying these common areas. While trying to “bring the cook out of the kitchen” and promote sociability, there becomes the challenge of combining two (or three or four) completely separate utilitarian spaces. Where some see a challenge, others see opportunity. 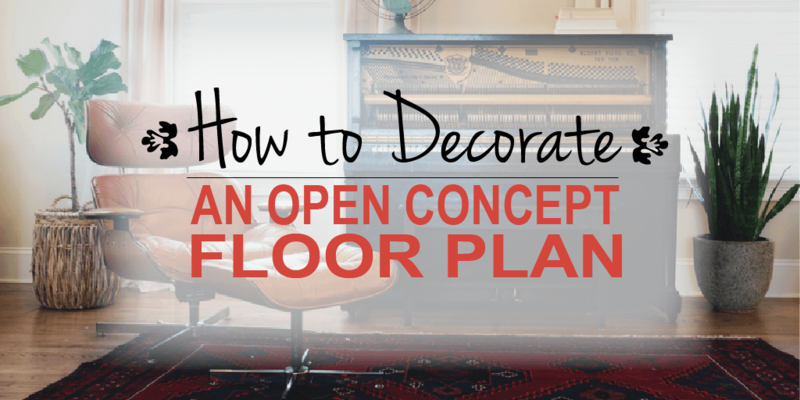 Interior Designers view the open concept as an opportunity to be creative. Instead of fixating on color and fabric they use space planning as a tool to create warmth and continuity that feels larger and works more efficiently than the compartmentalized living spaces of the previous century. Space planning is a concept in which a designer allocates size and position of individual “areas” within a larger space based upon lifestyle first and then addresses color and texture second. For example, a family with school-aged children may elect to position a larger table/workspace near the kitchen so that the parent can multitask and children can feel connected. A home designed for entertainment might place a comfortable seating area far from the kitchen. Once the room is divided into these “adjacencies” according to function, then you can help them communicate with each other. A good interior designer will begin by first selecting color for a major surface such as the wall and then echo that color throughout the room with fabric, area rugs, and accents. It is generally considered that rugs are the easiest and most important way to delineate spaces within a large room. It is prudent, to begin with the largest piece and work toward the smallest accent. If you choose a quality rug you will have the ability to change wall color and fabric for years and years using any of the accent colors in a rug. Again; the object should not be to match colors but rather to use as accents. Identical rugs are sometimes good to use as small pieces but be careful: using them to define two or more large living spaces often gives the impression of a hotel lobby rather than a home. Dark colors make objects in the room appear smaller. Light colors do the opposite so consider the size of the space that you are working with. Similarly, rugs that exceed the edges of the furniture will make the whole space appear larger. Probably the most common mistake is to choose a rug that is too small for the furniture. Choosing an area rug can be tricky. Although most classic Oriental rugs actually pair really well regardless of design, keeping at least some uniformity in the dominant field color goes a long way toward maintaining a cohesive look. In general, you can mix any two rugs together if they share the same color palette. Combining Tribal, Formal and Art Deco designs together in the same space need special consideration…if you’re so inclined, feel free to reach out to us at Pangaea Carpets. We have professionals on staff to field your design questions. Here is a secret of the rug trade: most programmed rugs, even hand knotted ones are made in a certain “line” that will feature various designs which all use the same dyes. When combining two or more major pieces together ask a trusted source to show you different rugs from the same line. This is a great way to select compatible pieces from a myriad of interesting designs. The result will be pulling off a consistent look without seeming like you tried to at all. Harmony within an open floor plan may seem like a challenge but it doesn’t have to be. Remember, it is more about the “feel” than the actual colors. The most beautiful bed of roses will not contain two plants that are exactly alike in shape or color. These subtle variations are what will give your space its true distinction. Nice article! I really like this article so much and got some great design room ideas. Thanks and keep sharing.